The New England Patriots are one of the most beloved teams in the NFL, with a storied history that is nothing less than spectacular. And the 2018 football season was no exception, claiming the NFL’s top honor. 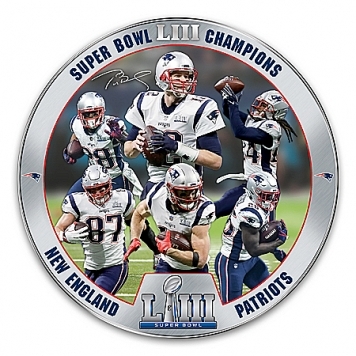 This Super Bowl LIII Champions New England Patriots Collector Plate captures all the thrill of that epic victory in a dramatic tribute officially licensed by NFL Properties LLC and NFL PLAYERS, and available exclusively from The Bradford Exchange. If you’re a diehard Patriots fan, don’t miss this chance to commemorate your Super Bowl LIII Champions with this must-have New England Patriots memorabilia, available in a strict limited edition of only 10,000!Handcrafted of triple-fired Heirloom Porcelain®, this New England Patriots collector plate showcases a rousing montage of full-color game day photography from their historic win. Then, for a museum-quality touch, it features a genuine platinum band that is emblazoned with Patriots logos, the team name and the official Super Bowl LIII logo. Fueled by the excitement of their football triumph against the Los Angeles Rams, intense demand is expected for this Super Bowl LIII Champions New England Patriots collectible; it makes an impressive Patriots fan gift too. Hurry to bring yours home – order now!